During work I was counting down lessons until a rare day off. After work, most of the teachers went for a small party at a nearby Izakaya called “The Lockup“. It is easily one of the most insane places I have ever been to in Japan. 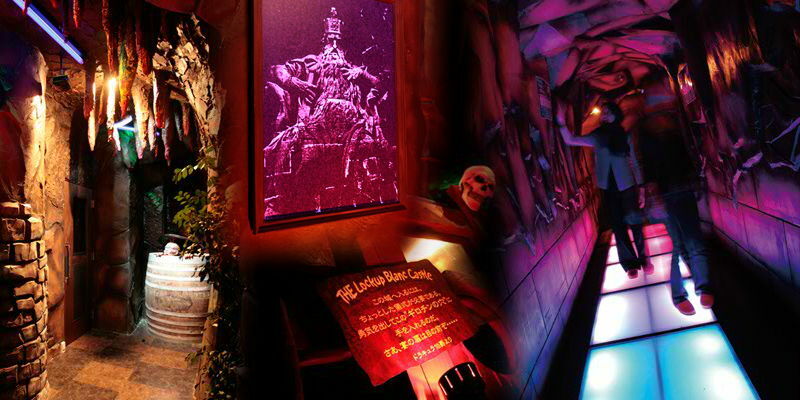 The Lockup is an izakaya chain that has a B-grade horror movie haunted house / insane asylum / prison theme. The leader of our group was handcuffed upon entry and led to our room by a waitress in a shiny fetish police uniform. Our room was actually a cell complete with metal bars and chains. All of the drinks were served in test tubes and beakers. I am not sure which movie or movies inspired the decor, but they were probably featured on Mystery Science Theater 3000. It was truly bizarre. We got a three hour all you can eat, all you can drink deal for the group. Half way through our evening there was a “jail break”. All of the lights started flashing, sirens starting blaring, and a bunch of monsters escaped and started running around trying to scare the customers. One of the monsters saw a room with 20 English teachers, many larger than him, and decided to move along quickly. After a few minutes of mayhem and monsters running around, the guards shot and killed the monsters, and Michael Jackson’s Thriller started playing through the sound system. I am honestly not making any of this up! Since we were English teachers, we all took very good advantage of the all you can drink deal. The group of us noisily stumbled back towards Kawasaki station. Just as we got close to the station, Mohammed realized that he was still wearing the izakaya’s toilet slippers, and that his shoes were back at The Lockup. We all had a good laugh at his expense. The entire evening was a lot of fun. I recommend The Lockup if you want a strange night out in Japan. This entry was posted on August 20, 2014, 8:00 am and is filed under Drinking, Friends and coworkers, Life in Japan. You can follow any responses to this entry through RSS 2.0. You can leave a response, or trackback from your own site.